DataFromSKI? Yes, we can count skiers too! We have moved from the Sky to the Ski! With our newly released DataFromSky Light, we are testing the software in unusual conditions and scenarios. Counting how many skiers are on the slopes? Not a problem at all. With our software, one can easily analyze how many people are currently on the slope, how many are waiting by the ski lifts, how many of them just stopped by a ski bar or restaurant or who is skiing outside marked slopes and much more! Upload your video to WeTransfer and send it to analyze@datafromsky.com – if you need more information, follow the instructions in this post. In many cities, there are places where many road users pass or stay in a complicated network of routes and get into a risky interaction. It can be difficult to get an overview of the whole situation and define the “hot spots” where the traffic behavior is simply non-standard. 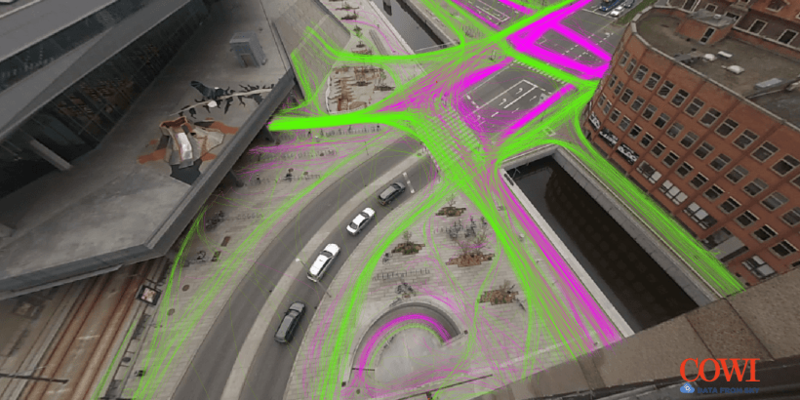 Our tool Data From Sky is in most cases be able to uncover, sort and analyze all movements of vehicles, cyclists and pedestrians in a larger area and evaluate critical parts of a road network, that might be risky for any traffic participant. This kind of overview and analysis can give traffic and urban planners a very good starting point for designing any adjustments. The figure below shows an area in the city of Aarhus in Denmark and displays the flow of cyclists (pink trajectories) and pedestrians (green trajectories) in the 2-hour period. The main goal of the analysis is to provide the Aarhus Municipality with an overview of cyclists and pedestrian movement in the analyzed area and identify some patterns in their traffic behavior. After having formed a detailed overview of all the different flows and routes, author of this study (Birger Villadsen, Traffic Specialist at COWI) has focused on those areas, where cyclists’ and pedestrians’ behavior gets into a collision. The detailed DataFromSky Analysis helped to analyze the problematic spots and draw up proposals for changes, that can help to simplify the traffic flow. Aarhus Municipality will evaluate the list of proposals and test them on the site by making temporary changes and observing whether they have the intended effect before the changes are implemented permanently. *full article can be found at Cowi Creators blog.